*NEWLY ENHANCED* with more help in contouring around the eye and brighening of dark circles! Our natural anti-aging eye gel has been newly enhanced with greater gentle eye contouring and brightening from white lupine. Our potent but gentle Anti-Aging Natural Eye Gel is packed with botanical extracts, vegetable proteins, vitamin C, collagen and peptides that help reveal youthful splendor, firmness, elasticity, plumpness, contour, smoothness and brightness around the eyes. Reduces appearance of wrinkles, dark circles, sagging skin and puffiness. Hydrates and soothes. Directions: Apply a thin layer around the eyes morning and night. "I received the products, beautifully packaged, a few days ago and already I am so impressed. Theface wash cream is superb, the eye gel as well, the facial spray wonderful. Your products excel the more expensive ones I was using from Origins. At 69, I can't compromise my skin care. You have a customer for life. Thank you, Joan." "My mom's friend LOVES the Advanced Eye Gel! She didn't think it would work, but it REALLY does! In fact, she is looking forward to not having to wear her glasses because her eyes look so good. And she also enjoyed the special packaging and samples." 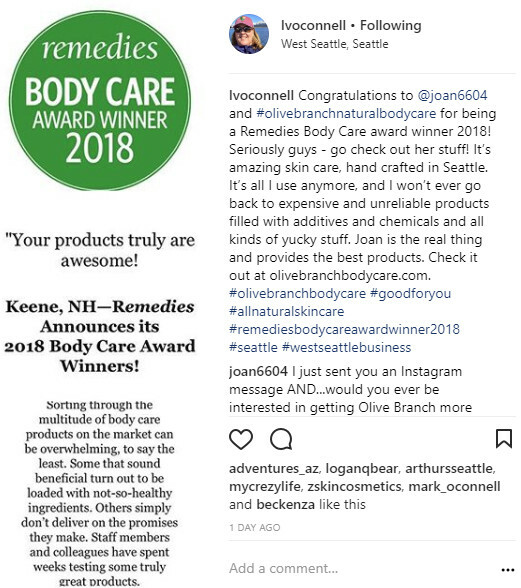 "I have been using the Olive Branch face care products and body lotion for the past few weeks and have already noticed a reduction in fine lines and dryness! My skin is firmer and at 62 years old I thought my skin would continue to look worse and thanks to Olive Branch products it looks better! I have some dry patches with psoriasis on my legs and using the Body Balm for a few weeks has helped clear up half of the dry patches and psoriasis. I have very sensitive skin and these products are very gentle. Thank you Olive branch for helping me look younger and feel better about myself!" "I appreciate your products. I think you have a skincare line that everyone should know about. I love the Anti-Aging Eye Gel. It really helps the skin and truly does lighten under the eyes. As an entertainer, we want to look our best, ha, whatever that is. " Sincerely, Primo Kim - Seattle, WA. "I have been using products form the Anti-Acne & Restoring Face Wash & Scrub, Anti-Aging & Restoring Face Lotion w/spf 30, and the Skin Perfecting Gel for only a short while, and already I see a big difference. My skin has not looked this clear and fresh in years. Even my mother commented that my skin was looking great. I love how I look and feel when using these products. I also have been using the Anti-Aging & Restoring Advanced Eye Gel and I have noticed that the area under my eyes is less dark and puffy. No longer do I look tired all the time, even when I am! I really love these products and I am so glad that at age 42 I have finally found a skin care line that works for me." *Plus 7 *NEW* Botanical and Vegetable Protein Anti-Aging Ingredients: Kakadu Plum Extract, Soybean Protein, Hydrolyzed Rice Protein, Cypress Essential Oil, Iris Extract, Helicrhysum Essential Oil and Alfalfa Extract. *Orange stem cells: anti-aging skin care ingredient from Spain that works by organizing the inner structure of the skin for a younger appearance. It redensifies the dermis structure, repairs the extracellular matrix, and improves cellular adhesion. The result is skin that recovers the elasticity it had 12 years ago, with a softer and more velvety complexion, plus a younger appearance. In plants, stem cells are capable of regenerating the entire plant. The stem cells used in this ingredient is sourced from renewable plant material in a sustainable and ecological process, without genetic modifications or solvents. *Chicory Root: tightening and collagen synthesis action, visibly erases signs of fatigue, enhances features, enables smoother makeup application and extend its wearability. *Algae Extract & Hyaluronate (from hyaluronatic acid): Algae is rich in vitamins and minerals and protects the skin from anti-oxidant stress, moisturizes and is especially suitable for the sensitive and irritated skin. Hyaluronate (from hyaluronic acid) is abundant in the dermis of young skin and is a natural polysaccharide (large sugar molecule) that occurs in various tissues (skin, synovial fluids of joints, connective tissues). Levels decline with age and is responsible for hydration, lubrication, & tissue stability, holds 500 times its own weight of water. *Sea Kelp Extract: has a high content of silicon, vitamins and minerals. Silicon helps strengthen skin and tissue thereby improving the appearance of wrinkles. The vitamins and minerals nourish and soothe the skin. *White Tea Extract: potent antioxidant and anti-inflammatory agent, inhibits collagen degradation in the skin by inhibiting collagen damage. *Squalane: Known as ‘Nature's Facelift'. 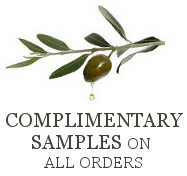 High purity botanical lipid obtained from olives. It mirrors human lipids in molecular structure and weight and is absolutely essential oil for the skin when a regenerative effect is desired. The skin has sufficient levels when it's young, and healthy. As we age the levels drop considerably and by the time we're in our mid-thirties, and forties, we no longer have sufficient levels to maintain healthy skin. It is believed that this drop off is, in part, responsible for many of the signs of aging skin, including the tendency to become easily damaged, thinner, and lack lustre. It can help to replenish the natural levels lost through the normal aging process, contributing regenerative activity to restore a more youthful appearance, and resistance to inflammatory conditions. *Kakadu Plum - High stable Vitamin C with strong antioxidant properties. Contains gallic acid and ellagic acid for antioxidant protection, and elastic and supple skin. *Lupinus Albus Seed Extract: Extracted from the coatings of sweet white lupine seeds. Anti-aging and firming ingredient that stimulates the synthesis of a high-quality collagen to increase elasticity and firmness in the skin, helping to remodel the eye contour. *Peptide (chain of six amino acids): Works through a unique mechanism which relaxes facial tension which may reduce the appearance of superficial facial lines & wrinkles with regular use. *Magnesium Ascorbly Phosphate (Vitamin C):Potent anti-oxidant (protects skin from oxidation), can improve appearance of aged skin (improves skin elasticity by enhancing collagen production), excellent non-irritating skin whitening agent that inhibits skin cells to produce melanin, lightens age spots. *Iris Florentina Extract - Rich in isoflavones from the iris flower and thanks to its estrogen-like activity, it helps to fight against wrinkle formation, dryness and skin slackening. Stimulates skin to compensate for decreased metabolic activity due to aging. Fortifies the dermis by limiting the degradation of structural proteins, reduces the depth of wrinkles, improves skin hydration and elasticity for an overall improvement in skin tone. *Organic Aloe Vera: potent moisturizer, regenerating & soothing/cooling agent. Has been postulated to stimulate the immune system and increase local blood circulation in the skin. Has been shown to improve the appearance of aging and/or dry skin probably by increasing the collagen synthesis and skin elasticity. Ingredients: Aloe barbadensis, Laminaria Saccharina (Algae) extract, sodium hyaluronate, ichorium intybus (Chicory) root oligosaccharides, caesalpinia spinosa gum, water, glycerin, arctostaphylos uva-ursi (Bearberry) leaf extract, magnesium ascorbyl phosphate, glycerin, xanthan gum, Citrus Aurantium Dulcis (Orange) Callus Culture Extract, Macrocystis pyrifera extract (Sea Kelp), Camellia sinensis extract (White Tea), Squalane (from olives), (C12-15 Alkyl Benzoate (and) Tocopheryl Acetate (and) Ubiquinone), Oenothera Biennis (Evening Primrose) Oil, Citrus aurantium amara (Neroli) oil, Daucus Carota Sativa (Carrot) Seed Oil Carrot Seed Oil, Lavender Essential Oil, Boswellia Frereana (Frankincense) Oil, Foeniculum vulgare dulce (Sweet Fennel) Essential Oil , Rosmarinus Officinalis (Rosemary) Leaf Oil, Lemon, Tocopherall, Acetyl hexapeptide-3 (peptide), filtrate, (lonicera japonica flower extract, lonicera caprifolium extract, populus tremuloides bark extract, glucono-lactone), Benzylalcohol dehydroacetic acid , Terminalia Ferdinandiana (Kakadu plum) fruit extract, Helianthus Annuus (Sunflower) Seed Oil and Lupinus Albus Seed Extract, Soybean Protein, Hydrolyzed Rice Protein, Cypress Essential Oil, Iris Extract, Helicrhysum Essential Oil , Alfalfa Extract.